Customize your bathtub with many types of jet systems! Click "More info" to learn more about each jet mode. Please select the finish of your Activ-Air jets. Note: Colors shown are not exact representations. Please select the finish of your Mass-Air jets. Note: Colors shown are not exact representations. 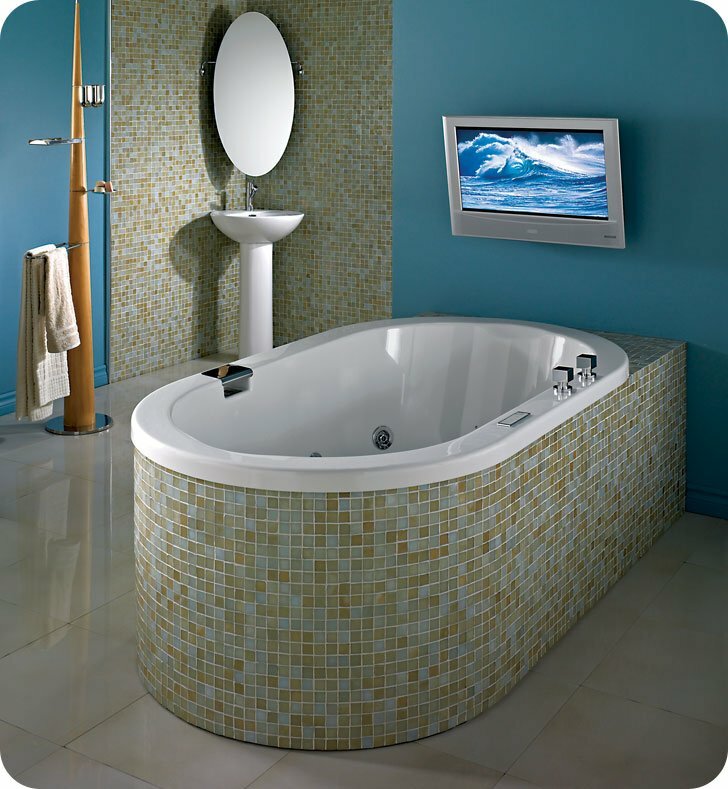 Allows to add extra Activ-air+ micro-jets at the bottom of the bathtub to enhance the relaxing effect. For Activ Air system only. Does not work with Activ Air combo systems. Please select the finish of your Whirlpool or Tonic jets. Note: Colors shown are not exact representations. Select the height of your tub lip. Please note that 1", 3" and 4" tub lips have a 3 week delivery time. Bone and Biscuit finishes have a 3 week delivery time. Black, Ice Gray and Sandbar finishes have a 6 to 8 week delivery time. Make your experience more colorful. The chromatherapy system is made of one, two or four chromatherapy lights and bulbs which allow you to create a relaxing or stimulating atmosphere. Add style to your modern bathroom interior with the Neptune Tao 60" x 32" Oval Bathroom Tub. Smooth fluid curves of this drop-in bathtub blend well with a deep ergonomic basin, equipped with an Ultim-O overflow and waste. High gloss acrylic material is durable, easy to clean and comes in one of the six beautiful finishes to create a custom look in your bathroom. Optional jet mode system, available in multiple types (Whirlpool, Mass-Air, Activ-Air and more) allows to experience the pleasure of full-immersion soaking, while other therapeutic features such as chromotherapy lights offer extra comfort and ultimate relaxation. Whirlpool: Included: 6 turbo jets, 5 micro-rotating back jets, 13 A pump, diverter valve and electronic control. Mass-Air: Included: 16 (11-5) injectors, Optima blower 750W (1 1/2 h.p.) with 300W heating element and backlit electronic control. Activ-Air: Included: 39 micro-jets, Optima blower 750W (1 1/2 h.p.) with 300W heating element and backlit electronic control. Mass-Air + Whirlpool: Included: 6 turbo jets, 5 micro-rotating back jets, 11 Mass-Air injectors, 13 A pump, Optima blower 750W (1 1/2 h.p.) with 300W heating element, diverter valve and backlit electronic control. Activ-Air + Whirlpool: Included: 6 turbo jets, 5 micro-rotating back jets, 35 Activ-Air micro-jets, 13 A pump, Optima blower 750W (1 1/2h.p.) with 300W heating element, diverter valve and backlit electronic control. Mass-Air + Activ-Air: Included: 39 Activ-Air micro-jets, 11 Mass-Air injectors, two Optima blowers 750W (1 1/2 h.p.) with 300W heating element and backlit electronic control. Mass-Air + Activ-Air + Whirlpool: Included: 6 turbo jets, 5 micro-rotating back-jets, 35 Activ-Air micro-jets, 11 Mass-Air injectors, 13 A pump, two Optima blowers 750W (1 1/2h.p.) with 300W heating element, diverter valve and backlit electronic control. Tonic: Included: 8 Oxygen jets, Optima blower 750W (1 ½ h.p.) with 300W heating element, Syllent pump with integrated in-line heater, 4 Chromotherapy lights and backlit tactile electronic control. ACRYLIC SHELL*: Limited lifetime warranty against manufacturing defects. *Except for AMAZE bathtub shells: Limited 4-year warranty against manufacturing defects (parts and labor). SYSTEMS: Limited 10-year warranty (parts and labor) against manufacturing defects; jets, pipes, fittings, electronic control pads, pumps, inline heaters, blowers, black box, remote controls, ozonator, wiring, etc. and leaks related to manufacturing defects. Limited 5-year warranty against manufacturing defects related to colored jet trims inside the bathtub. BODY JETS: Limited 2-year warranty against manufacturing defects; Limited 10-years warranty covering leaks related to manufacturing defects. Limited 2-year warranty against manufacturing defects related to colored jet trims inside the shower. WOOD TRIM: Limited 1-year warranty against manufacturing defects. GENERAL: Mood light, Chromotherapy, Chromo +, NEPTUNER, neck pillows, handles and other options. Limited 5-year warranty against manufacturing defects for all parts. METAL and FORGED IRON: Limited 5-year warranty against manufacturing defects. Outer: L 59 3/4" x W 31 1/2" x H 22 3/8"
Inner: L 51 1/4" x W 23"